Looking for clever small business solutions? Try asking the animals. They say animals are honest. I’ve met enough crafty ones to realize some have a grand sense of humor. No need to climb aboard that anthropomorphizing high horse (the mere suggestion draws flame wars in some equine circles). That’s not where I’m going here. Instead, consider spending time paying attention to the critter characters around you and you’ll discover ways to help you better understand the people in your life. Remi, my current mutt and constant companion, is obedient by nature. Formal training wasn’t part of her nurturing. In fact, she was six when she first donned a leash. All assume some expert spent exhaustive hours training this dog. That term “following you around like a puppy dog” – Remi’s the poster child. Gatsby was the class dunce (he was smart as a whip but tricks for treats interested him not one whit). I put dozen of hours in between formal obedience lessons trying to avoid next-class embarrassment – to no avail. Sometimes he felt like responding as cued – most often not. If I were to do a comic strip of that mutt, it would include him giving me the finger. Once given a job he could appreciate, though, we were an inseparable team with him as amazing assistant horse trainer, protector, groundhog eradicator and friend. Even though Gatsby seemed aloof, everyone sensed we were deeply connected and realized he’d do remarkable things if I needed help. Gatsby and I spent three years trying to teach Remi to be a working farm dog. We gave up at the same hysterically acknowledging moment. Remi’s an incredibly loyal, eagerly responsive and purposefully entertaining pet (think John Belushi in Animal House). Her world is all about pleasing and being acknowledged (or loved). Gatsby got his joy from a hard day’s work that included choosing to do what suited him with fierce independence. Remi’s attentive, sweet and that helicopter tail always tells you she’s happy to see you. Cowardly and needy, her pleasure is all about being a good pet. Sometimes animals can teach us a lot about human nature. One of the things I learned while training young horses (they trained me more – that took a good number of years to acknowledge) is there’s a lot you can apply to human interactions from non-verbal communications. Animals can also help you understand what may work great for one may infuriate another. There isn’t that challenge of emotions that play into a human calculated response driven by concern for hurting your feelings or feigning friendship. Small business owners who get adept at recognizing what’s not said to help make clients and prospects more comfortable will find success. Authenticity is a big buzz word these days. If your goal is to build a profitable business, however, your message and strategy should consider your prospects may not see the world as you do. Too many think being authentic means brutal honesty, making a message all about you or pronouncing you only want to work with like-minded people. That’s not a good formula for growth – or happiness. 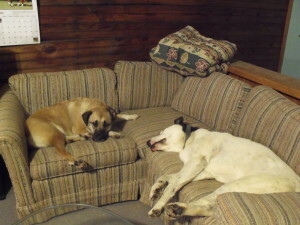 My two mutts on my Potter NY office couch. 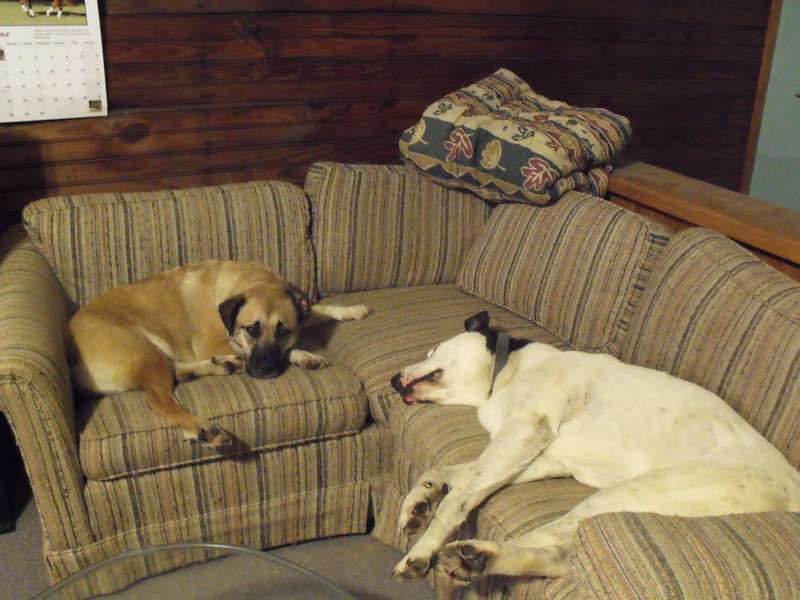 Gatsby is the black and white one (shocker, eh). Gone are the couch, Gatsby and the farm. Remi remains. Gatsby was tough (and destructive) before we reached an accord (and rapport). Ultimately, he replaced employees who didn’t have his aptitude and innate ability with young horse training demands. He kept me safer and saved me a lot of money (and maybe a few strokes). Remi’s love, loyalty, companionship and entertaining antics are things I appreciate. She makes me look good, even though I take no credit for her behavior. She earns her keep with the smiles she provides. Both dogs enriched my life, but I learned not to ask Gatsby to obey the same way I’d never expect Remi to protect. What made one dog get excited about the day ahead terrified the other. People, like animals, respond differently to the same message. While adopting your style to accommodate varying personality types is one approach (I’ve found the Enneagram to be a better here than Myers & Briggs or any popular quadrant typing methods), it’s not always the smartest solution. That’s why I delegate. Vendors can help you look strong where you’re weak. They can also land a sale or satisfy a customer on short-term tasks in ways you can’t. This can range from paying someone for a couple of hours to attend a pitch meeting (read figurehead) to bringing in project experts for contract deliverables (statisticians, web design specialists, voice talent, etc.). Being a successful small business owner is easier if you develop an ability to effectively read your clients and prospects. The messages you send – written, verbal, online, body language, psychographic, etc. – don’t necessarily have to be all you. Authentic is done better by realizing where you’re weak so you can find people to help you look better. There’s no shame in building a team that offers more than you can alone. Everyone wins. If you’re looking for better solutions for communicating with people in their language, try spending some time around animals that don’t use words. You might gain unexpected insight for small business solutions. 7 Responses to Looking for clever small business solutions? Try asking the animals. What a delightful and clever post Nanette. And that’s a very helpful way to look at things. Your insights about how and why to build a team to serve your clients fully always get me thinking. Thank you. Aren’t you sweet, Deborah. Honestly, teams were a tough thing for me to embrace initially. Now, I wouldn’t want to do business without them. Animals have long been my teachers, Nanette, so I’m right there with you, Remi, and the great Gatsby himself. In my animal communication work, I’ve found that our furry friends often have great insight into our life situations, including work dilemmas. Their insight usually focuses on our own well-being, which, when attended to, can lead to wise decisions, which all circles back to good business. And I’m a fan of the enneagram, too! Animals are wonderful reality checks, aren’t they, Harmony? Agreed, those critter responses are so often more about us than we might realize. Some of the biggest testers I’ve encountered ultimately provide my biggest moments of insight. Of course, you’re right, everything circles back sooner or later. I so enjoyed reading this post…so much of what you said rings true with me. I’ve been blessed with that ability to almost instinctively know what people need from me. As both an artist and teacher of art…I have had to learn how to not only ‘see’ the world through my student’s eyes, but also appreciate that view in their work. I try very hard not to influence their style with mine, but rather teach them through technique how to improve. As a pet portrait artist, the animals I have met and worked with never fail to teach me something new about life and I just can’t ever get enough of those sweet, sloppy kisses! LOL! What an interesting perspective. Great post. Lately I keep hearing about the Enneagram. I know this is not new however, it seems to be repeating in my life recently. Might you be interested in writing a post on that? I would definitely enjoy reading more on that. Elda, I am no expert on the Enneagram – just a fan. I’ll give it some thought, though (one thing I find disappointing about most translations is they focus almost entirely on the negative outcomes of unbalanced cases – maybe there’s something there).